Back to the Stone Age. Tarzana: Edgar Rice Burroughs, Inc. Signed presentation copy inscribed by the author, Edgar Rice Burroughs to his daughter, Joan Burroughs, inscribed: To Joan, With a world of love, Papa, Tarzana, September 20, 1937. Illustrated by John Coleman Burroughs. Fine in a very fine bright dust jacket. Joan Burroughs starred as Jane on the serialized Adventures of Tarzan radio show in the 1930s. 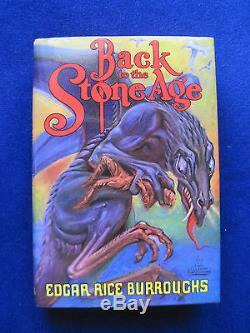 The item "BACK TO THE STONE AGE SIGNED by EDGAR RICE BURROUGHS to His Daughter Joan" is in sale since Friday, September 21, 2012. This item is in the category "Books\Antiquarian & Collectible". The seller is "catstarbuck" and is located in Santa Barbara, California. This item can be shipped to North, South, or Latin America, all countries in Europe, Australia, Japan, South Korea, Indonesia, South africa, Hong Kong, Israel, New Zealand, Singapore, Saudi arabia, United arab emirates, Qatar, Bahrain, Malaysia, Bangladesh, Brunei darussalam, Egypt, Jordan, Cambodia, Sri lanka, Macao, Maldives, Oman, Pakistan, Reunion, Viet nam.